When most people talk about Norway, they talk about the fjords. The mountains. The train rides. The incredible scenery and natural beauty. But you hardly hear anyone rave about Oslo, the Norwegian capital. As an avid reader of other travel blogs, I can't really remember reading very many posts about Oslo — in fact, I can't name one off the top of my head. I assumed this was just because it was just “another” big European city; I assumed that maybe there weren't that many things to do in Oslo that really stood out. But then I went there on my 10-day trip around Norway. And guess what? Oslo is totally cool. Oslo is clean and colorful and filled with green spaces. The people are friendly (even the palace guards will talk to you here! ), and it has a fun mixture of both old and modern architecture. And it's not really even that big — the population of Oslo is just 620,000. 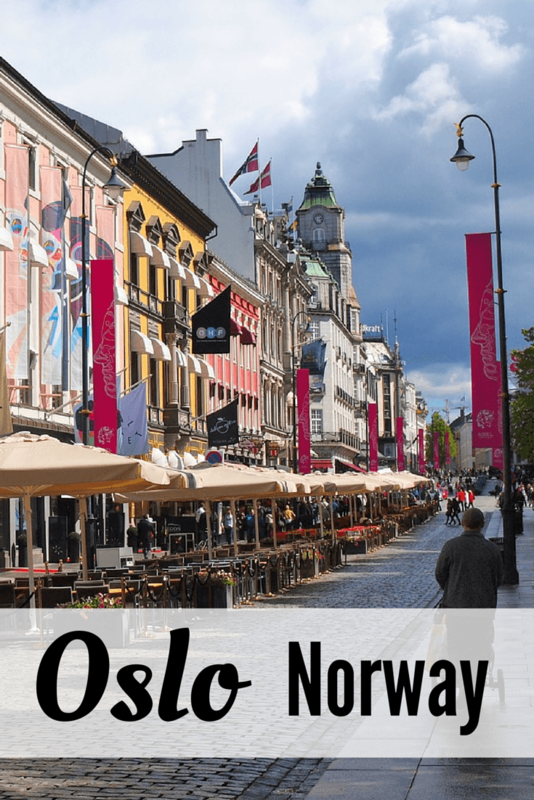 Oslo is definitely NOT just another cookie cutter city in Europe, and I don't think you should skip over it when you go to Norway. In fact, there are so many cool things to do in Oslo that I recommend spending at least a few days there! 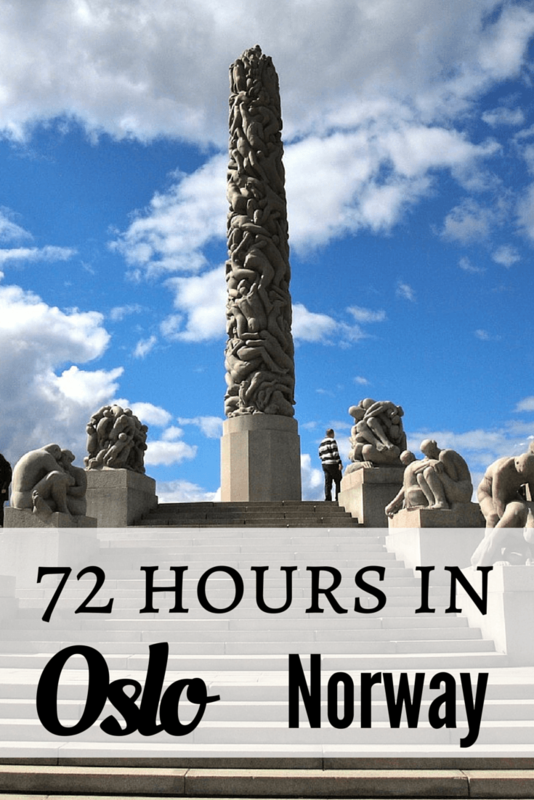 I was in Oslo for about 48 hours, which I think it a decent amount of time to see the highlights, though I think a long weekend in Oslo would be ideal. Whenever I get to a new city, I like to do one thing first: WALK. 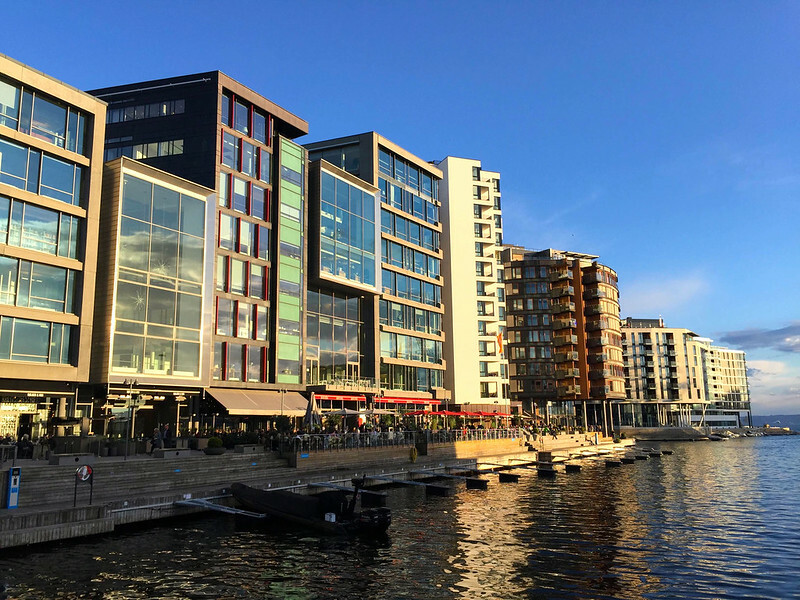 Walking around a new city is the best way to get to know it, in my opinion, and walking along the trendy new waterfront in Oslo was a neat way to see the old and modern being mixed together. The waterfront area has been revamped in recent years, with a bunch of really modern buildings going up alongside some of the older ones. They're building a big promenade that will eventually let you walk for kilometers. Some of my favorite attractions to check out on this walk included the Akershus Fortress, the Opera House (which is actually classified as a work of art, meaning you can walk all over it — even on the roof), and City Hall. Oslo's City Hall doesn't look all that special from outside, but inside it's covered in murals and a beautiful marble floor sourced entirely from within Norway. Also on my walking tour of Oslo, I hit up Karl Johans Gate, the main street in the center of Oslo that leads from the train station to the Royal Palace. It's colorful and partially tree-lined, and would be a great place to sit down and sip on a cup of coffee. Oslo has a TON of cool museums — we're talking really unique museums that you won't find anywhere else in the world. 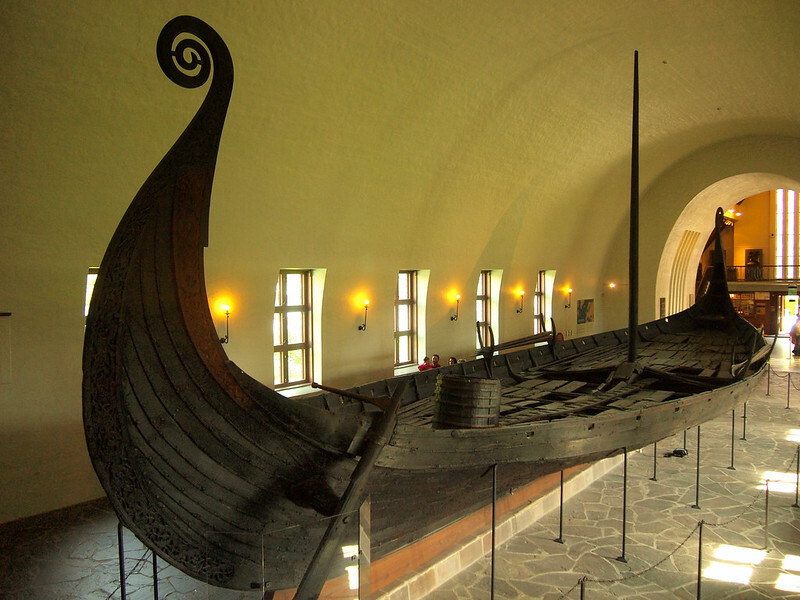 You could spend a whole long weekend in Oslo just hopping from museum to museum! I would highly recommend setting aside some time to check out at least a couple of these museums in Oslo. I mentioned before that Oslo has a ton of green spaces, and one of my favorites was Vigeland Park — the world's largest sculpture park made by a single artist. 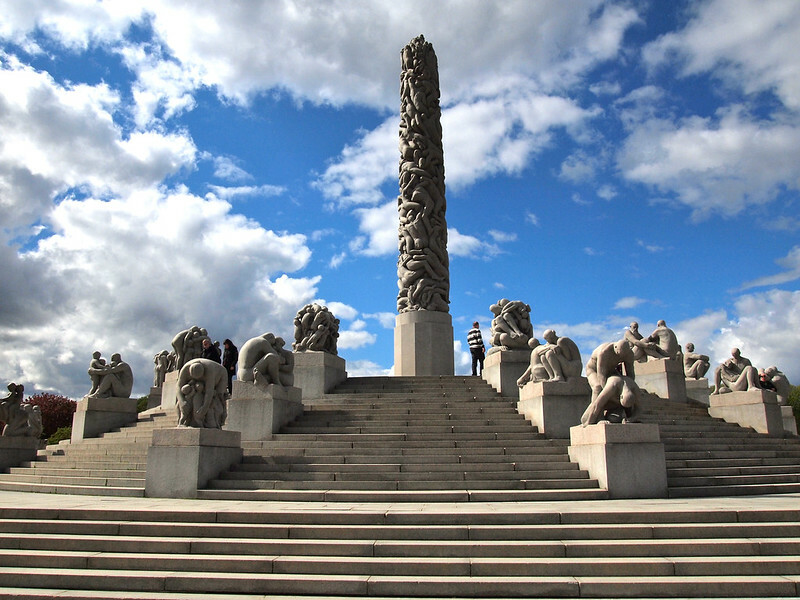 The park was completely designed by artist Gustav Vigeland, who not only laid out the 79-acre park, but also completed the more than 200 sculptures displayed within it. It's no wonder that this is one of Oslo's top attractions. It's free to enter, open year-round, and has tons of interesting sculptures to see. Note: This section does contain affiliate links. 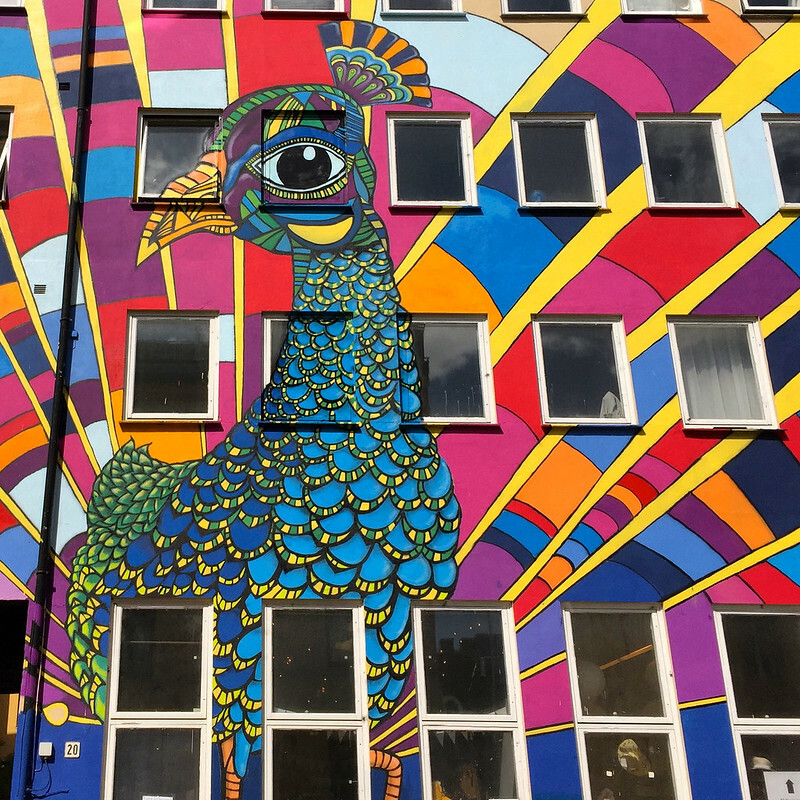 I stayed at the funky hotel in Oslo's Vulkan neighborhood, which is about a 15-20-minute walk into the city center, or about 10 minutes by bus. The neighborhood around the hotel is a bit hipster in nature, filled with street art and cafes (many of which are actually really affordable by Oslo standards!). I loved the floor-to-ceiling windows in my room, and the fact that I had a really cool work space (not to mention a ridiculously comfortable bed — Norwegians know how to make beds!). And the best part? It's not a ridiculously expensive hotel. If you book online, you can find rooms for less than $150 USD per night (which is great for Norway!). On my second trip to Oslo, I stayed at the , which is close to Oslo's central train station (where the airport train arrives, and where trips like Norway in a Nutshell depart from). This hotel has a good location closer to the city center, and had one of the best breakfast spreads I've ever seen in a hotel! I found food in Norway to be one of the most expensive things. You could easily go out and spend $40+ on a small meal. I went out for a couple of nice dinners, but also did my best to look for places that wouldn't break the wallet. Just like most big cities around the world, there are tons of annual events to enjoy in Oslo. There are multiple music festivals throughout the summer, including a chamber music festival, a jazz festival, a world music festival, and many more. There's also a ski festival held in Oslo each March (Norwegians love skiing of all sorts), and a big Pride festival usually in June/July. Can you save money in Oslo? A big question I got on my Facebook page while I was traveling around Norway was, “Is it as expensive as people say it is?” And, well… I'm not gonna lie: Norway IS expensive. Oslo IS expensive. But that doesn't mean you can't save money. Hotels don't have to break your budget. You can find cheaper food if you spend some time looking. And you can save a lot on everything else with an . 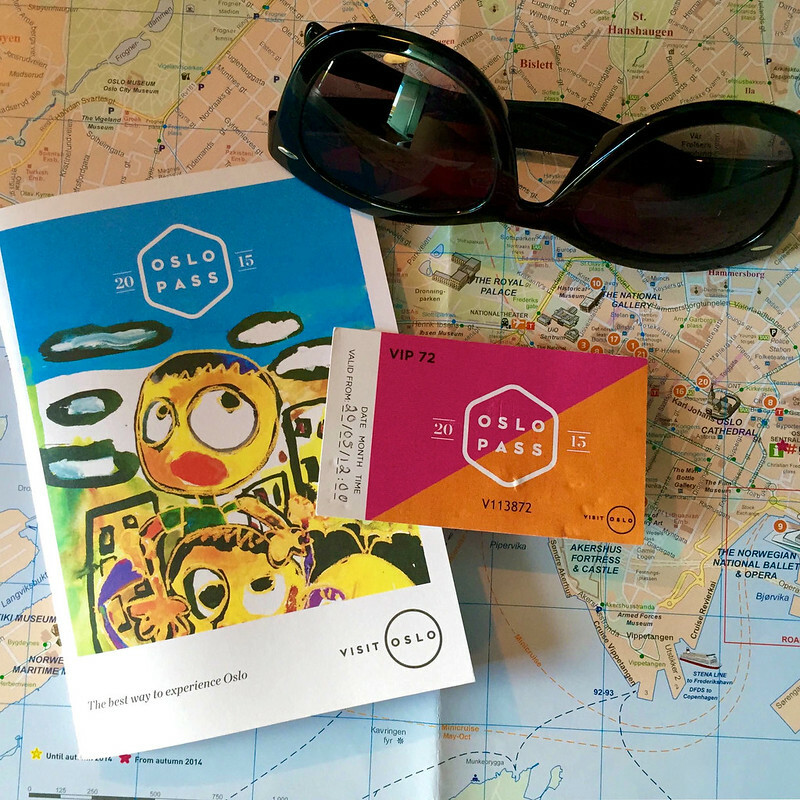 Like many other city passes around the world, the Oslo Pass gets you free or discounted admission to a ton of sites and attractions all around the city of Oslo. You can get into all those museums I listed above (and more) for free; you can take free walking tours; you can get discounts on fjord cruises, bike tours, and even the ski simulator at Holmenkollen. And you also get free rides on ALL public transport with your Oslo Pass — buses, trams, metro, and even ferry boat. So what do you think of Oslo now? Have I sold you on the Norwegian capital? *Note: Special thanks to Visit Oslo for hosting me in the city! As always, opinions are 100% my own. I was only in Oslo less than 24 hours since my flight was delayed, but from what I experienced, I couldn’t help but think it was a super palatable city (and I imagine it would be much better to visit in summer rather than when I was there in winter)! Yeah it was a lot cooler than I expected it to be! I actually found myself wishing I’d had more time there, because I didn’t get to see everything I wanted to (though, I did lose nearly half a day to jetlag, which didn’t help either!). I agree, Oslo looks totally cool! I’d definitely like to soak up its city buzz and stunning attractions. Yeah it’s definitely a city I’d spend more time in! The peace prize is handed out in Oslo. Stockholm have the prizes in Chemistry, Literature, Physics, and Physiology or Medicine. It does look very cool! Excellent article, Akatuki! My wife and I spent four days in Oslo in May and thought the same as you did about the city. We even hit almost all the same places, including the ski jump and Mathallen Food Hall, which aren’t on everybody’s list. We didn’t think that there was enough to do in the city to keep us occupied for that long, but we were wrong. You’re totally correct about Oslo (and Norway in general) being very expensive. Lodging isn’t too bad, but food is very expensive. I suggest hitting ethnic restaurants (Indian, Thai, Middle Eastern) to cut down on your food bill. Yeah, I didn’t know if I’d be able to fill 2 full days in Oslo before I went, but then I discovered there’s so much cool stuff to see/do! I didn’t get to all the museums or parks I wanted to visit, so I’ll definitely have to go back! I just wrote about Oslo a week or two ago! I was there over Easter, when the city practically shuts down, and STILL had a good time! I didn’t get to go in City Hall, though. Those murals look amazing! I probably never would have gone into City Hall, but I was walking around with a local guide and he assured me it was worth it – and it was! Haha, well, the photos are a little misleading – it rained both days I was there, but thankfully the rain didn’t last all day! Whenever I see pictures of Oslo, it’s always the photo of the Opera house which looks extremely modern and I’m not really a big fan of modern cities. Your post made me realize though that there is more to Oslo than the Opera house. That main street is lovely!!! Yup, there’s lots of modern architecture around the Opera House, but there’s definitely more than just that in Oslo! Walking is my first thing to do also! The waterfront is where I would head to…was it pretty long? Even if it’s dark, cold waters, it’s so calming to look at. The waterfront area is pretty large. They’re still working on the official promenade, which I think will eventually be about 9 kilometers long! Oh, Oslo is in many ways a nice city to live in. but as a tourist you don’t see the dark side of what we natives call “The biggest village in Europe”. The litter, the lack of a decent public transportation system. Biking in our capital is probably one of the most dangerous thing you can do. The city is a pollution trap and in the winter the air is yellow green because 30 000 cars are pouring in and out of the center of the city. Then we have a rampant use of drug abuse. Just try the Riverwalk (and rent a personal life-guard before you do.). However, the city is pretty safe and the bright, sunny summer evenings are fantastic. I grew up in Oslo and now live in Sydney, and I think you just lack perspective. I used to complain about the public transport system in Oslo, but I think we are so spoiled that we’re annoyed as soon as the bus is 5 minutes late. When I got to Sydney I was shocked at how poor their public transport system is and will never ever again complain about Oslo’s! Also the drug abuse is not nearly as widespread as in Sydney where you see people overdose in clubs regularly and taking stuff like MDMA and coke is seen as completely normal. Sure you will see heavy drug users around the central area in Oslo just as you would in any other big city, but the drug abuse problem really could have been much worse, trust me! It’s true about biking though, I hope Oslo can learn a thing or two from Copenhagen to make biking safer! I feel the need to correct Robert on his comments there… Oslo has one of the, if not THE best, public transportation coverages, worldwide. The metro network is fairly extensive, and there are also several tram lines as well as buses criss crossing the city. The paths along the Aker river, which Robert refers to as the River Walk, is not at all that dangerous anymore. It’s well lit, there are more and more restaurants and pubs along its length that provide safety and activity, and the police have managed to scare away most of the more seedy elements. The biking part I agree with, mostly, but it’s not like it will kill you to ride a bike. Just choose the right streets and parks/green spaces and you’ll be fine. Pollution can be pretty bad in winter, but from what Robert writes it sounds like Beijing or Mexico City, and that is certainly not the case. Try riding a bike in Amsterdam. I agree with Ole…just came back from Oslo, did the river walk and enjoyed it a lot. My AirBNB hosts were a bit shocked too when I told them, but honestly on a sunny afternoon there is nothing to worry about. And while you’re in Oslo don’t forget to visit Ekebergparken on a sunday and enlist (online in advance) for a visit to James Thurells’ skyspace. It is truly a special experience! Thank you for writing about a diffrent part of Norway then most! I like have you think, its nice to see something of a surprise when traveling! And I love to read how someone who visit Oslo is talking about the city. Its allways nice to see what you have close by with new eys, makes you want to explore your own backyard more. I grew up outside the city, but close to it. At the moment located 40 min train ride/30 min car ride away in a smaler city. But if you go back, Bergen is a nice city because of how it is located, even for us Norwegians. I will recomand you to take the train into the city if you do go. But Oslo also how the easy access to nature sourounding the city aswell. South in summer time, nice coast villiages. Lofoten has the beaches without people and fish villages, northern light in the north.Fjords are mentioned for a reason. And one of the things I love the most the lakes in the forrests to swim in on hot summer days. Water is clean, its abondent with space/few people compared to many places and the woods smells so good. It feels private and free. Not everyone likes that tho! I guess you have that in Ohio aswell? Its been cold here in may and june this year. But when summer hits like this last week it can get realy hot. the north had 40 c and we in the east have had 27 c. Thats the charm and the “annoying” thing with Norway when it comes to planning, you never know what you get! I hope you get to experiance the light and warm summer nights tho! Its what I allways get amazed by specialy after I have spent a summer in an other country, the winter passes and then it gets so light..and then to sit outside when its warm. I grew up in Norway and love the beauty and varity of the country. I sadly didn’t get to experience any of those warm summer nights while I was in Norway, but I still really loved the country! It is very cool, Izy! Great, informative post!! Reminded me of last year when I spent six months in Oslo and it soon became my favorite city ever. The proximity to nature is a definite that you don’t see in many capital cities. My absolute favorites were island hopping and going to Sognsvann (huge lake surrounded by forest). It’s a truly magical city! You’re right about it being expensive! The grønland area was the most affordable place to eat out, but then again, it’s not Norwegian food. If you are in a tight budget then it would be best to stay somewhere with a kitchen and cook your own meals. Again, great post and love your blog btw! Oslo was the first major city in Scandinavia that I’ve visited, and it definitely impressed me! Thanks for the suggestions, Julie! Have you sold you me on the Norwegian capital? You sure have? It looks amazing. And yes every Nordic country isn’t budget-oriented but they’re so worth the cost. I went to Finland in the Spring and it was expensive. That’s just the way it is. I knew this already and just sucked it in, went to the food market and ate sushi every day! I’m going to Sweden sometime this year and it’ll be the same. Spend the money and enjoy the experience! Yes, I totally agree that, despite the expense, Scandinavia is totally worth it! Hope you make it to Oslo sometime! I have extensively traveled through Sweden in my life, and briefly through Denmark and Finland. I have always sort of avoided Norway just because, as you mentioned, the high prices of everything. However, you have sold me! I guess I just needed someone to tell me that it can be affordable. I’m a big mountain fan, and their mountains I’ve heard are the stuff of dreams. Not to mention, my town in small town Iowa is in fact, Norwegian, so it would give me big points with the locals 😉 Thanks for the great post/inspiration! Norway is absolutely worth it! I loved it (even in the rain!). I think one of the hottest tips for the cheapest possible Norway holiday (outside Oslo), would be to travel with a tent/backpack. During the summer, this will be a very nice way to travel, because, as long as you are not tenting in someone’s back-yard, you can put your tent up anywhere you like. We see a lot of German and other European tourists, crisscrossing the country in the summer with caravans and mobile-home cars(?). They live and prepare food in their vans/caravans and rest at assigned camping-areas (with toilet/shower/washing facilities). Some even bring their own food, although, the absolute cheapest food you can get, is in the regular grocery stores (Rimi, Rema, Ica, Kiwi etc). There are cheaper hostel types of places one can stay. If you are a gang, there are various opportunities to rent a lodge for several days. Then you split the fee and cook your own food. Cool to see someone doing a write-up on Oslo. All great tips Ole. Thanks! love to se people enjoy my fave city! (im norwegian) tho im a country girl at heart i love to go for day trips in to oslo just to look at it all or to go shopping. i lived there for a year, and totally miss it! but oslo is not a super dog friendly town (to live in) so i packed my bags & moved back home so that my furry kids cant play outside more. hoping to get some good oslo time in over the summer tho! paradIS ice cream shop at the far end of akerbrygge is the best! all home made and super yummy! I like your posted photos very much. For a while I go back to 1985 & 1990. We were going arroun Oslo. It’s certainly not a cheap city, but then again nowhere in Norway is! Still worth visiting though, if you ask me! Hi Akatuki, thank you for a very nice review of Oslo! One of the Norwegian favourite pastimes is hiking (gå på tur) and any city will have some nearby forest or mountain with marked trails in summer and freshly prepared ski tracks in winter. When it comes to saving money, it so happens that you can camp for free in these areas. In Oslo you can take the metro into the immense woods ( a 20min trip from the city centre) and pitch your tent just about anywhere and why not do so in front of your own personal lake in order to go for a swim in the morning before taking the metro into the city? A by many overlooked event in Oslo is the Ski Fest in March at Holmenkollen. This might not sound terribly interesting to someone not into crosscountry skiing and ski jumping, but it is great fun and a mere 5000 people stay in the woods around Holmenkollen for a whole weekend sleeping in tents pitched in the snow and some partying is admittedly done at night. I was going to say that it is worth it, but then the Ski Fest is free, as well as the outdoor camping. Yes, you would have to be a little bit sporty I guess. But it would not be your average city break either. Very good to know, Marie! Thanks for the tips! Im going to Oslo in October and this post just made me even more excited!! Wow, Oslo looks like a very unique city! I was surprised when you mentioned that very few travel bloggers are posting about Oslo– from what you’ve described here, the city definitely seems like it has a great sense of culture. You have definitely sold me on Oslo! I mean, it’s possible I’m just reading the wrong blogs! Haha. But, on the whole, I feel like a lot of bloggers skip Scandinavia because of the cost, and when they do visit Norway, they tend to go for places like Bergen that are closer to the famous fjords. Which is a shame – because Oslo really IS cool! Great photos. I’ve never really considered Scandinavia but with TBEX in Stockholm next year and just having visited the Baltics, I’m definitely thinking about it more. It’s definitely worth considering! (Though, Scandinavia is way more expensive than the Baltics! Haha.) I think TBEX will give a lot of people a good excuse to go, though. Which is a good thing – it’s a part of the world so many people dream of visiting! Yes unfortunately I ran out of time to get to Ekeberg! But I’ve heard it’s great. I like the write up, but if you go to Oslo again.. try to do Island hopping in the fjord with the Public transportation pass and head up in the forest on the same day. You can sit an view the Islands you went on earlier the day. Not many capitals you can do Island hopping in. Great tip! And I’m sure that would be awesome to do on a summer day! A gem – Emanuel Vigelands mausoleum is a tall, spaceous room, sparcely lit with frescos covering the walls. Compared with Rome, ( Rome was the last main city I visited ) is Oslo in fact quite cheap to eat , shop and live in 🙂 And easier to shop in than Rome, Paris and London. Oslo have a lot of quite large shopping centers, and easy to get to. Forexample in Rome there is really difficult to get to a shopping center without using taxi who is very expencive since its a long way from centre of Rome. We used the train and bus , but it was difficult to find and not a pleasent part of Rome. In the shoppingcenters in Oslo you will find both cheap and expencive shops. For al pocket`s 🙂 And there is a lot of shoppingcenters easy reachable with train or bus. Also some in the middle centrum. And two quite long shopping streets. You have a lot of different restaurants where you get meals from about 9-10 pounds and up. Also there is good grocerystores everywhere, where you can buy food if you want to make your own lunch or breakfast. And living , there is hotels in al price classes. You get a room in a hotel or B&B for two persons from about 9 pounds, cheaper if you take a hostel. So I think that Norway and Oslo has got a undeserved bad reputation about how expencive it is. Well, I certainly wouldn’t call Oslo cheap, but it certainly doesn’t *have* to be as expensive as many people assume it is! Oslo is a beautiful city. Thinking about visiting Norway in May. I noticed these posts are over a year old. I feel I must add however: I am of Nordic descent, albeit Swedish rather than Norse. I did attend and graduate from a Norwegian founded school in the U.S., St.Olaf College in Minnesota. I know there some ethnic differences, but to me, Scandinavian is any of three/four ethnicities: Denmark, Sweden, Norway and Finland. Back in MN a “mixed” marriage is a Swede marrying a person of Norwegian descent. BTW, they’re all Lutheran. Ultimately, we all live peacefully! Oslo looks absolutely fantastic. From the Norsk Folkemuseum to the \Vigeland Park the city looks absolutely amazing. My one question about Oslo is what are the local “Street Foods” that people typically eat? Is it herring in white sauce or what other items do they enjoy? So glad that I could bring back some great memories of Oslo for you! I love the idea of visiting Oslo but it sounds like i must set aside a very healthy budget for the travel, especially for the cost of food and meals. I now have a 11 year old boy who can eat a lot. Norway is quite a pricey destination! Maybe you could consider staying in an apartment or other self-catering option so you could prepare some meals for yourself. Groceries are much more affordable in Norway than eating out for every meal!